After a year of fund-raising, Rugby Police Bowls Club recently presented a cheque to the Warwickshire and Northamptonshire Air Ambulance for £ 1,256.60. This was raised by their members in memory of a former player and tourist Rodger Sirett, who unexpectedly passed away on Christmas day last year. Rodger's family chose the Air Ambulance as their charity for donations, instead of flowers at his funeral. Rodger, who also played for the Grange Bowls Club in Rugby, was a well-liked and respected man and bowler in the area and was for many years, until his untimely death, on the Executive Committee of the Warwickshire County Bowls Association. The money was raised by R.P.B.C. members throughout the year, with various events, including a fun day against Oakfield B.C. and on their annual long weekend bowls tour. The Chair of Rugby Police Bowls Club David Owen said, "We are a small club with only 28 members, many of whom play for other clubs throughout Warwickshire, with our players coming from as far afield as Solihull and Nuneaton. 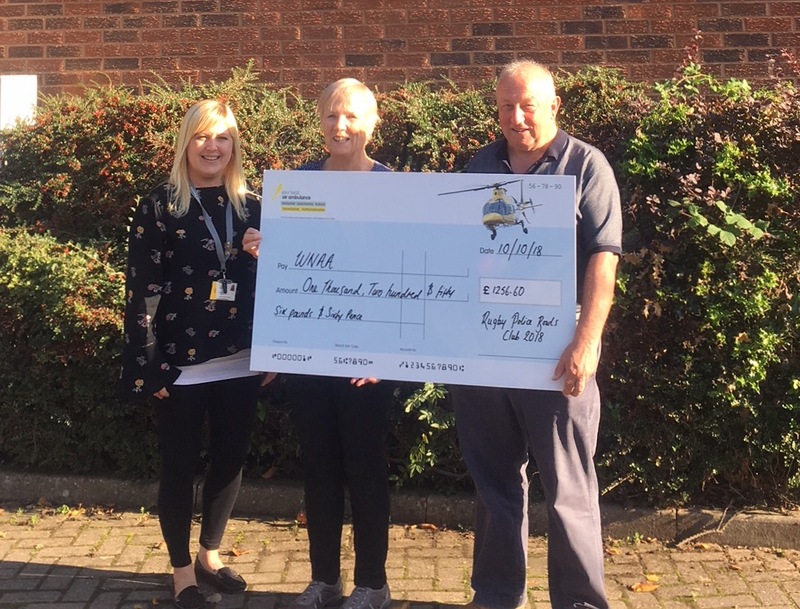 The club over the past thirty years has raised thousands of pounds for local charities, with this being the third time that we have supported the Air Ambulance Service in that time. In the past three years, the club has raised nearly £ 6,400, providing defibrillators for two bowls clubs in the Rugby area and donating to a local Dementia Charity, who support both sufferers and their families." The Secretary of the club, Rosemarie Geden, said: "I would like to thank our members and tourists, for their generosity over the last 12 months. Without their donations of numerous bottles and other prizes which have been used to raise money, we would not have raised this considerable amount for a charity. None of us would ever wish to use, however we know they will be there for us and our families if the need arises. I understand that the average cost of a call out is £ 1,700 so hopefully this money will help to support this great charity in a small way". Bowls England would like to commend all those involved in raising such a significant amount for this worthy cause.